I made another beet smoothie today. No, I don’t really like beets, but we had the puree in the freezer, so I feel like I’m doing the responsible thing and using them up. I hate wasting food. The thought of throwing food away makes me ill. I blame my father. This time I tried the Garden Ginger Salad version. It called for a MUCH larger amount of beets, and celery juice. 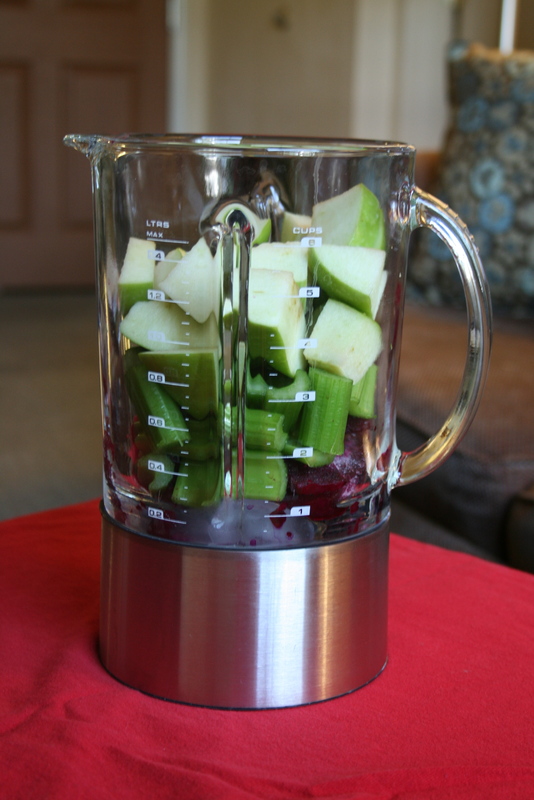 Instead of attempting to make celery juice by blending stalks and then straining out the solids (too much work! ), I chose to throw it all in the blender. Perhaps a bad decision… Between the celery “stuff” and the additional beets, the apple and ginger didn’t do much to help the flavor! If yesterday’s beet/applesauce smoothie was too sweet, this one was just the opposite! I ended up adding 2 tbsp of honey, which helped. A little. I think the added celery solids pumped up the volume, so this ended up making two large drinks instead of one. Each smoothie, with the addition of 1 tbsp of honey each, only came to 150 calories. Not bad for a little snack. Do I relish the thought of the other smoothie waiting for me in the freezer? 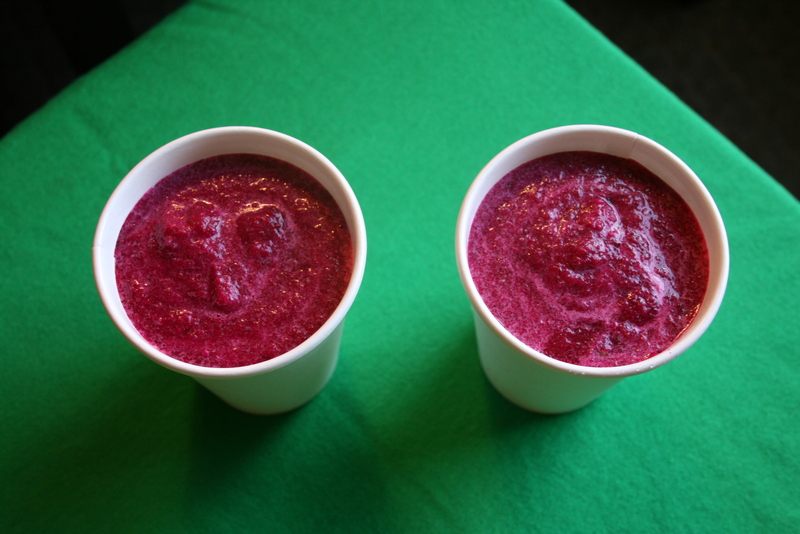 Not really… I think beets are an OK additive for smoothies, not so much as the star of the show! And be sure to wear an apron when making smoothies, or anything, really, with beets! I was glad I did! Yay for days I run a lot (three with Hadrian, then four by myself)! I’m eyeing a piece of Abigail’s leftover killer chocolate mousse birthday cake! Posted on August 2, 2011 February 27, 2016 by thehealthypineapplePosted in #fabfoodTagged beets, Co-op, East Aurora, Exercise, Food, smoothies.